596 Acres will present all 155+ urban renewal plans that the City has ever adopted in an intervention directly on the Panorama of the City of New York, realizing the online Urban Reviewer map on a 1:1200 scale of the 9,335 square foot Panorama. Exhibition made possible thanks to the support of Mapzen and the Queens Museum. A walking tour of the Willets Point Urban Renewal Area with Dr. Jack Eichenbaum, Queens Borough Historian, will start from, and return to, the Queens Museum. East of Citifield (the New York Mets baseball stadium) is a sewerless hardscrabble area of auto junkyards and related businesses that has twice beaten back attempts at redevelopment. But as it is located between the new stadium and a booming Chinatown in Flushing, public and private interests are again trying to transform “Willets Point.” We’ll confront ecological issues and learn why “Willets Point” is a misnomer. RSVP required; participation is limited. Opening Reception with public presentations in the panorama by the 596 Acres Urban Reviewer Team & Mapzen. A discussion of the law of eminent domain with Michael Rikon, Esq. & Paula Z. Segal, Esq. Continuing Legal Education (CLE) credits for free to attorneys who attend provided by the CUNY Community Legal Resource Network. All welcome. RSVP required here for attorneys to recieve credits. Michael Rikon is a shareholder in Goldstein, Rikon, Rikon & Houghton, P.C., which has concentrated its practice in eminent domain cases since 1925. From 1973 to 1980, Mr. Rikon served as a Law Clerk to the Honorable Albert A. Blinder of the New York State Court of Claims. He began his legal career as an Assistant Corporation Counsel for the City of New York, a position he held from 1969 to 1973, where he was a senior trial attorney in the Condemnation Division. From 1973 to 1975, Mr. Rikon was a consultant to the New York State Commission on Eminent Domain, which drafted the EDPL. He earned his B.S. at the New York Institute of Technology; his J.D. from Brooklyn Law School, and a Masters of Law from New York University School of Law. Michael Rikon is a frequent lecturer on the Law of Eminent Domain. He is rated “A.V.” by Martindale-Hubbell, “Best Lawyer” and “Super Lawyer.” He is listed in Who’s Who in America Law. Paula Z. Segal, Esq. is the founding director of 596 Acres, New York City’s land access advocacy organization. She is a graduate of CUNY School of Law at Queens College, where she was a Haywood Burns Fellow in Human and Civil Rights. CLE Credits provided by Community Legal Resource Network at CUNY School of Law – CLE credit will be offered only to those attorneys completing entire sessions; attorneys attending only part of a session are not eligible for partial credit. Attorneys arriving late are welcome to attend the program but will not be eligible for credit. Attorneys wishing to receive CLE credit must sign in the program’s attendance register prior to and following the CLE program; once a speaker begins the program, the sign-in sheets will be removed. Similarly, attorneys leaving the session early are also ineligible for CLE credit. Planners Network NYC hosts a discussion on the past, present and future of the Mitchell Lama program, one of New York’s most important and embattled affordable housing initiatives. With Charles Chawalko on the history of the program and the experience at Southbridge Towers; Jackie Peters (invited), of the Putnam Coalition, on organizing against predatory equity in a Harlem Mitchell Lama rental; and Alexis Smallwood on the experience of tenants at Ocean Village in the Rockaway. Moderated by Katie Goldstein, Executive Director of Tenants & Neighbors. Charles Chawalko performed digital cartography and data corrections on the Urban Reviewer map (urbanreviewer.org). His interest in the project came from his own thesis work and struggle concerning the potential privatization of his Mitchell-Lama cooperative (South Bridge Towers) that was born out of the Brooklyn Bridge Southwest Urban Renewal Plan. Jackie Peters has long been a tenant organizer and a leader in the Putnam Coalition, a group of residents fighting to keep their homes affordable. Alexis Smallwood is the Community Outreach Coordinator at Rockaway Wildfire and a resident of Ocean Village/Arverne View, a Mitchell Lama development recently transitioned to a private owner. Katie Goldstein is the Executive Director of Tenants & Neighbors, a grassroots organization that helps tenants build and effectively wield their power to preserve at-risk affordable housing and strengthen tenants’ rights in New York. 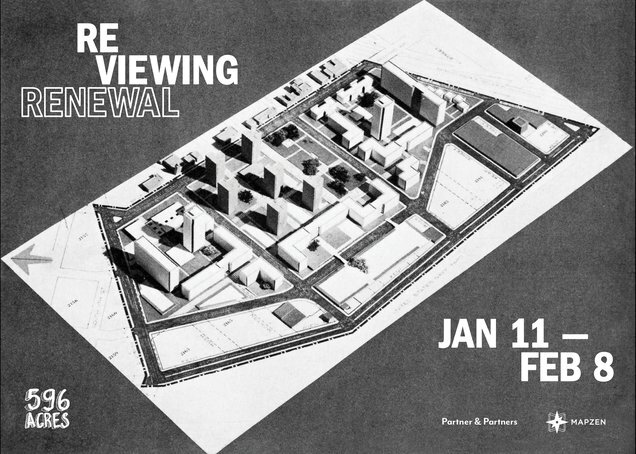 A preview of It Took 50 Years, followed by a discussion about lessons for organizers about the urban renewal process from members of the Cooper Square Committee. In addition the filmmakers, Val Orselli of the Cooper Square Mutual Housing Association, Harriet Putterman of the Cooper Square Community Land Trust, and a representative from Picture the Homeless will lead the discussion. Dave Powell was raised and still lives in Brooklyn, NY. He has worked as an organizer for the Metropolitan Council on Housing, the New York State Tenants & Neighbors Coalition and the Southern Bronx River Watershed Alliance. He is currently the Director of Organizing and Advocacy at the Fifth Avenue Committee in Brooklyn. Dave has been quoted on housing issues by the New York Times, The New York Daily News, Crain’s New York Business, The Village Voice, City Limits and other media. The Village Voice recognized his activism on behalf of New York City tenants in its “Best Of 2003” issue. Dave is a former member of the National Writers Union (UAW local 1981) and has been a collective member of ABC No Rio on the Lower East Side for over 20 years. He holds a BA in film production from and a Masters in Urban Planning, both from Hunter College. Ryan Joseph was born in Trinidad, West Indies and now resides in Jersey City, NJ. As a freelance documentary photographer and filmmaker his work focuses on documenting and bringing to light marginalized communities and subcultures. Ryan has displayed at Aljira Center for Contemporary Art in Newark, New Jersey and The John Hopkins Bloomberg School of Public Health, in Baltimore, Maryland, among other venues. He has been published in The New York Times, Jet Magazine, En Foco Photography Magazine, Urban Ink Magazine and has worked as a still photographer for Asante film production, The Black Candle. His cinematography credits include The Rink which he co-produced. Kathryn Barner, editor of It Took 50 Years, has over 20 years of documentary post-production experience. Her credits include My Brooklyn (2012), Banished: How Whites Drove Blacks Out of Town in America (2006) and The Gun Deadlock (2001.
Cooper Square Committee’s mission is to work with area residents to contribute to the preservation and development of affordable, environmentally healthy housing and community/ cultural spaces so that the Cooper Square area remains racially, economically and culturally diverse. The Cooper Square Mutual Housing Association and Cooper Square Community Land Trust were created in furtherance of that mission. Picture the Homeless is a lead organization in the New York City Community Land Initiative (http://nyccli.org), which is working to expand the opportunities for putting NYC land in community trust. Samuel Zipp is an Associate Professor of American Studies and Urban Studies at Brown University and the author of Manhattan Projects: The Rise and Fall of Urban Renewal in Cold War New York. He has written articles and reviews for a number of publications, including The New York Times, The Washington Post, The Nation, The Baffler, Metropolis, Cabinet, and In These Times. Screenings of films Rompierdo Puertas (Break and Enter) (1971) & The Case against Lincoln Center (1968), both from Third World Newsreel, framed and followed a discussion with Jennifer Hock and Mariana Mogilevich on the city-facilitated transformation of the Upper West Side. Rompierdo Puertas details the takeover of buildings by Latino families in New York City slated for urban renewal. The film highlights the community’s struggle against displacement and their determination to obtain equality and decent housing. The Case against Lincoln Center depicts the building of Lincoln Center for the Performing Arts, that displaced 20,000 Latino families. Juxtaposing the atmosphere of Lincoln Center with the vibrant street culture of a displaced neighborhood, the film correctly predicts the process by which the West Side was to be turned into a high-rent area for the upper middle class. Jennifer Hock is an architectural and urban historian with an interest in the impact of social movements on design and planning practice and the creation of urban space. She received her PhD from Harvard University in 2012. She has lectured and published on Jane Jacobs, mid-century American architecture, and urban renewal, and is working on a book on architecture, planning, and the civil rights movement in Boston. She currently teaches at the Maryland Institute College of Art. Oksana Mironova is a researcher and writer focused on housing policy, urban development, and alternative economies. She was born in the former Soviet Union and grew up in Coney Island, Brooklyn. Her work has appeared in Urban Omnibus, BKLYNR, Progressive Planning, and Shelterforce. Williamsburg’s South Side with Deputy Brooklyn Borough President Diana Reyna, Shekar Krishnan, Anusha Venkataraman and The Broadway Triangle Community Coalition. Transfiguration School in Williamsburg and Pace University in Pleasantville, New York. The Broadway Triangle Community Coalition (BTCC) represents the authentic voices of community residents from Williamsburg and northern Bedford-Stuyvesant calling for an inclusive public planning process and integrated affordable housing in response to the city’s efforts to rezone the Broadway Triangle in Brooklyn. This coalition includes over 40 church, civic, educational and community-based organizations that represent the area’s largely Latino, African-American, and Hasidic communities. The coalition formed six years ago to advocate for fair housing and a transparent, participatory rezoning process for this Urban Renewal Area—the largest plot of vacant land in the borough for affordable housing. The BTCC advocates for a comprehensive plan for the Broadway Triangle, one that ends longstanding residential segregation in this area of Brooklyn, maximizes the affordable housing that can be built given the great need in this area, and provides sustainable resources for the surrounding low-income communities. Shekar Krishnan is the Director of the Preserving Affordable Housing Program at Brooklyn Legal Services Corporation A (“Brooklyn A”). He leads its fair housing and community-based advocacy on behalf of tenant and neighborhood groups in North Brooklyn. He is one of the lead lawyers on Brooklyn A’s Broadway Triangle fair housing case against the City of New York, which the organization started five years ago. Shekar was also an associate at Weil, Gotshal & Manges LLP and Patterson Belknap Webb & Tyler LLP, serving as pro bono counsel to Brooklyn A and as a member of its board. He clerked for Senior United States District Court Judge Jack B. Weinstein in the Eastern District of New York. Shekar received his law degree from the University of Michigan Law School, where he was a Clarence Darrow Scholar and contributing editor of the Michigan Law Review, and his undergraduate degree from the Cooper Union for the Advancement of Science and Art. He is a member of the board of directors of Citizens Union and El Puente. Shekar’s publications include “Advocacy for Tenant and Community Empowerment” (CUNY Law Review), “Lock Up Crooked Landlords” (N.Y. Daily News Op-ed), and “Without an Attorney, the Scales of Justice Are Weighted Against the Poor” (New York State Bar Association Pro Bono News). Anusha Venkataraman is a hybrid urban planner, writer, artist, and activist, whose work focuses on empowering communities to lead change rather than respond to it. She is currently Director of the Green Light District initiative at El Puente, a community human rights institution in Brooklyn, NY. The Green Light District is a grassroots ten-year campaign for sustainability, equity, community wellness, and Latino cultural expression in the Southside or “Los Sures” neighborhood. Anusha edited the books Intractable Democracy: Fifty Years of Community-Based Planning (2010) and Beyond Zuccotti Park: Freedom of Assembly and the Occupation of Public Space (2012, with colleagues), and is a contributing editor and writer for Outpost Journal, an annual publication that features art and activism in small and medium-sized U.S. cities. Anusha completed her masters degree in City and Regional Planning at the Pratt Institute, with a focus on arts and community development, and a bachelors degree in International Relations at Brown University. with Queens Borough Historian Dr. Jack Eichenbaum, Kalin Callaghan of the United Peninsula Working to Achieve Responsible Development (UPWARD) coalition in Rockaway and others to be announced. Kalin Callaghan, an organizer with Rockaway Wildfire, grew up amongst artists and activists in Rockaway Beach. She studied fine art and children’s studies at Brooklyn College, and has worked as an artistic instructor for the Rockaway Artists Alliance for 10+ years. Peripherally involved in political activism since her teen years, the aftermath of Hurricane Sandy thrust her into purposeful community organizing on a larger scale. The destruction of her hometown, and rebuilding and redevelopment efforts to follow, compelled Kalin to work to ensure that her community would both lead and benefit from the recovery process. She has coordinated a campaign to develop a Community Benefits Agreement for Arverne East. She is raising two boys in the Rockaways. The United Peninsula Working to Achieve Responsible Development (UPWARD) coalition is based in Rockaway, Queens. The grassroots coalition is focused on equitable development in the 81-acre portion of the Arverne Urban Renewal Plan Area that has been empty for over 40 years. Sarah Friedland’s documentary films and installations are concerned with personal stories that reveal larger histories and intricacies about place and society. Friedland’s works with Esy Casey have screened widely in the US and abroad and have been supported by grants from the Jerome Foundation, the Paul Newman Foundation, the William H. Prusoff Foundation, The Princess Grace Foundation, the Ford Foundation, and the Center for Asian American Media. In 2009, after the debut of her feature documentary Thing With No Name, she was named one of the “Top 10 Independent Filmmakers to Watch” by the Independent Magazine. She is a recipient of the 2014 Paul Robeson award from the Newark Museum for her feature documentary The Rink. Her recent documentary Jeepney (directed by Esy Casey produced by Esy Casey and Sarah Friedland) will be broadcast on PBS in 2015. She is a 2014 LABA House of Study fellow and is currently working on two projects: Memorials (with Esy Casey), a feature documentary about the way America memorializes its dead; and 5 x Lydda, a documentary video installation. She is currently an Assistant Professor of Film and Film Studies at Wagner College. Ryan Joseph was born in Trinidad, West Indies and now resides in Jersey City, NJ. As a freelance documentary photographer and filmmaker his work focuses on documenting and bringing to light marginalized communities and subcultures. Ryan has displayed at Aljira Center for Contemporary Art in Newark, New Jersey and The John Hopkins Bloomberg School of Public Health, in Baltimore, Maryland, among other venues. He has been published in The New York Times, Jet Magazine, En Foco Photography Magazine, Urban Ink Magazine and has worked as a still photographer for Asante film production, The Black Candle. Strategies, tactics and tools of community participation in response to urban renewal. Attorney Amy Laura Cahn and historian Marci Reaven will talk about the disempowering force of “blight” declarations and role of community planning boards and people’s plans, looking at New York City and Eastwick, Philadelphia–the largest urban renewal site in the USA. Activists from the contested Seward Park Urban Renewal Area on Manhattan’s Lower East Side will join the conversation, and Gabrielle Bendiner-Viani and the Layered SPURA / City Studio project from the New School & Buscada will host a pop-up exhibition and lead an interactive workshop in which participants will be invited to take on roles in a community struggle over its future. Marci Reaven is the Vice President of History Exhibits at the New York Historical Society, and a former director of the Place Matters project (www.placematters.org). Amy Laura Cahn, Esq. is a lawyer at the Public Interest Law Center of Philadelphia and Director of the Garden Justice Legal Initiative. Amy Laura provides legal and advocacy support to community gardens and farms in historically disinvested communities, and works on environmental justice issues. In 2014, her article “On Retiring Blight as Policy and Making Eastwick Whole” was published in Harvard Civil Rights-Civil Liberties Law Review. Gabrielle Bendiner-Viani is a photographer, urbanist and curator, and is the creator of the Layered SPURA project, a six-year public art, activist and teaching project in conjunction with her City Studio class at the New School. Gabrielle is co-founder of Buscada (http://buscada.com/), an interdisciplinary practice on place and dialogue, and is Assoc. Director of Civic Engagement Initiatives and professor of Urban Studies at the New School. She holds a PhD in Environmental Psychology from the Graduate Center, CUNY and her creative research addresses the experience & politics of everyday place in London, Buenos Aires, Oakland, CA and New York. The Layered SPURA / City Studio project, created by Gabrielle Bendiner-Viani, explores the complexity of the Seward Park Urban Renewal Area (SPURA) on the Lower East Side. Over 40 years ago, the City of New York cleared 14 square blocks on the south side of Delancey Street, yet most of the planned housing on the site was never built. Still primarily used as parking lots, but now the subject of large-scale development, the site has long been contested by a divided neighborhood. The Layered SPURA/City Studio project has built long-term collaborations between community organizations and New School students to create exhibitions, art and research to foster new spaces for conversations about SPURA’s future. Damon Rich is a designer, planner, and visual artist. He will present work about and around urban renewal, including exhibitions The City Without a Ghetto (2003), Abuse of Power: The SPURA Story (2006), Red Lines Housing Crisis Learning Center (2007–9) and Mix and Match (Nevarca–>New Ark) (2010). At the Queens Museum in 2009, Rich’s Cities Destroyed for Cash used 1431 plastic markers to map every block in New York City with three or more foreclosure filings on 1-3 family homes onto the Panorama of New York City. Damon will also discuss applications of planning exhibitions for practice in his work as founder of the Center for Urban Pedagogy (CUP) and Planning Director for the City of Newark, New Jersey. Program by the University of Orange with Dr. Mindy Fullilove, Molly Rose Kaufman, Rod Wallace, Havanna Fisher, Aubrey Murdock and the film Urban Renewal is People Removal (2005). Mindy Thompson Fullilove, M.D. is the President of the University of Orange. She is also a board-certified psychiatrist who is interested in the links between the environment and mental health. Under the rubric of the psychology of place, Dr. Fullilove began to examine the mental health effects of such environmental processes as violence, rebuilding, segregation, urban renewal, and mismanaged toxins. She has published numerous articles and six books including Urban Alchemy: Restoring Joy in America’s Sorted-Out Cities, Root Shock: How Tearing Up City Neighborhoods Hurts America and What We Can Do About It, and House of Joshua: Meditations on Family and Place. Rodrick Wallace received an undergraduate degree in mathematics, and a PhD in physics, from Columbia University. He worked in the property insurance industry, and then as technical director of a public interest group, examining the impacts of policy and socioeconomic structure on public health, safety, and order. These efforts involved adaptation of analytic methods from ecosystem theory to the study of administrative data sets. After postdoctoral studies in the epidemiology of mental disorders, he received an Investigator Award in Health Policy Research from the Robert Wood Johnson Foundation. His peer reviewed publications have been largely in the social sciences and public health, with more recent books and papers focused on evolutionary process and cognition, at and across various modes, scales, and levels of organization. He is presently a Research Scientist in the Division of Epidemiology at the New York State Psychiatric Institute, associated with the Columbia University Medical Center. Havanna Fisher is a budding artist from Harlem, New York. She is a high school of Fashion Industries graduate and a recent graduate of the New School. She received a Bachelors’ of Fine Arts for fashion design from at Parson’s School of Design as well as a Bachelor’s of Liberal Arts for dance from Eugene Lang. Havanna has long been interested in using the skills and techniques that she has acquired to combine the arts with education to bring about political awareness and thus probable change within the American landscape of ideological identity. Molly Rose Kaufman is the Provost of University of Orange. Aubrey Murdock is the Academic Dean of University of Orange. Urban Renewal is People Removal brings uprooted residents together to weave a people’s history of Newark starting in the forties and continuing up until today. Urban renewal is not a thing of the past. Many large housing projects, whose construction displaced thousands, are now being torn down under the same banners that brought them into being less than 50 years ago. Written by Mindy Fullilove. The University of Orange is a free people’s university based in Orange, NJ, that builds collective capacity for people to create equitable cities. For more information visit universityoforange.org. Paula Z. Segal is the Director of 596 Acres, New York City’s community land access advocacy organization. In addition to supporting 30 successful neighborhood campaigns for official community access to vacant publicly owned lots and transform them into gardens and pocket parks, the organization looks for opportunities for residents to be in the charge of what happens to their neighborhoods. She is the curator for Reviewing Renewal. The Tragedy of Urban Renewal: The destruction and survival of a New York City neighborhood depicts New York City’s Manhattantown (1951) – one of the first projects authorized under urban renewal. The Manhattantown project destroyed six blocks on New York City’s Upper West Side, including an African-American community that dated to the turn of the century. The city sold the land for a token sum to build a middle-class housing development. Then came the often repeated bulldoze-and-abandon phenomenon: with little financial skin in the game, the developers let the demolished land sit vacant for years.